These tiles are designed to offer many of the features given by Commercial Grade Rubber Flooring Tiles but with a very economical price. Made from recycled tyre rubber and engineered to handle heavy-duty wear, Home & Fitness Rubber Flooring provides outstanding durability, flexibility, comfort and slip-resistance. Home & Fitness Rubber Flooring Tiles are designed to be aesthetically pleasing and heavy duty to remain blemish-free with protection against cracking or breaking, even when used outdoors (must be undercover if used outdoors). Safety is the number one concern within the home. Your family's health and safety is our top priority. Home & Fitness Rubber Flooring surpasses all legislation and safety requirements in slip resistance, fire behaviour and smoke emission. No harmful raw materials are used in the production process ensuring every Home & Fitness Rubber Flooring tile is free of asbestos, halogens or PVC. Home & Fitness Rubber Flooring uses highly flexible compounds providing a high level of noise abatement. By using the highest quality rubbers and compounds, flexibility and permanent resiliency are maintained throughout its life offering a very high degree of comfort under-foot and anti-fatigue. Simply sweep the surface of your flooring with a soft-bristled broom or use a vaccuum to clean. Home & Fitness Rubber Flooring contains a microbial treatment which ensures freshness at all times and reduces the risk of mould build up. Home & Fitness Rubber Flooring contains a high percentage of recycled rubber and contains no substances that harm the environment. It is halogen free, formaldehyde free and PVC free. Home & Fitness Rubber Flooring itself can be fully recycled and does not generate toxic substances at the end of its life. RTE8 Economy Rubber Floor Tiles are available in black and sized 1m x 1m with a 8mm height and weight 6.5kg. Why Choose Home & Fitness Rubber Flooring Tiles? 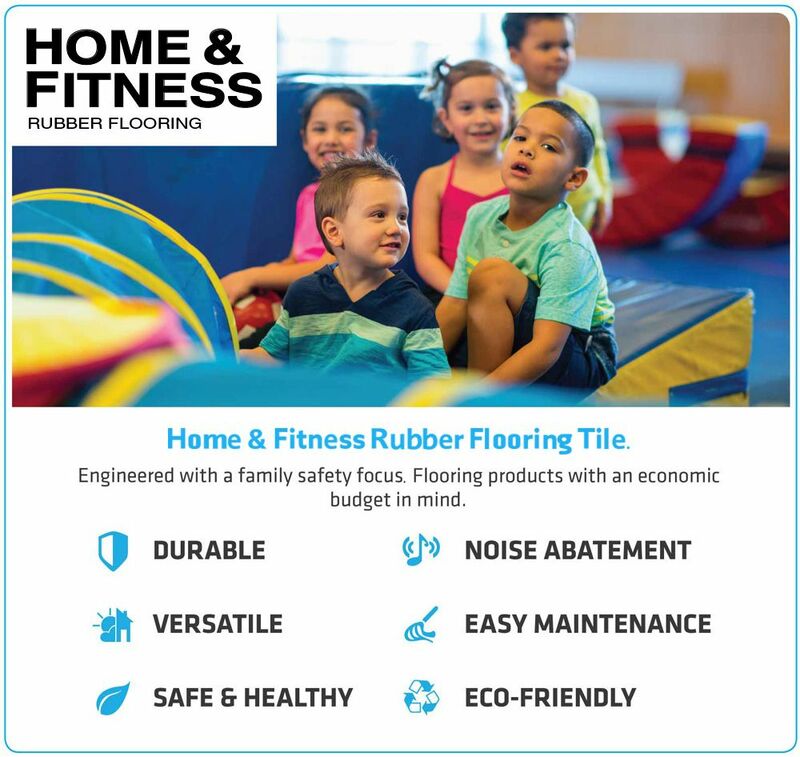 Home & Fitness Rubber Flooring Tiles have been tested for Formaldehyde content, Phthalates, Lead and VOC. Home & Fitness Rubber Flooring Tiles pass all respective tests. Home & Fitness Rubber Flooring Tiles are safe to use. Produced by ISO 9001:2008 registered manufacturer of high quality resilient rubber flooring products. Economy Rubber Gym Tile - 1m x 1m x 8mm - no bevelled edge(black) gym safety surface tiles, moulded under pressure and heat. Designed to provide a resilient, durable, slip resistant surface with excellent impact attenuating properties. Made of 100% tyre rubber shred bound by a clear MDI polyurethane binder. Environmentally friendly with no Formaldehyde, no Phthalates, no Lead and low VOCs. Produced by ISO 9001:2008 registered* International manufacturer of high quality resilient rubber flooring products. Exactly what we were after. Thankyou.